General Electric Co.’s NBC Universal is starting a 24-hour local news network in New York, in what could be the first of several such channels around the country. NBC hopes the network will draw in new viewers and help the company weather a weak local TV advertising market that has depressed revenue at many of its individual stations. The 24-hour “hyper-local” news network will launch on the digital tier in November and share newsgathering resources with WNBC, New York’s NBC-owned station, which will continue to have its own daily newscasts. The new network will face competition from several existing 24-hour local news outlets, including Time Warner Inc.’s NY1 network in New York City and Cablevision Systems Corp.’s seven News 12 cable networks in the New York metropolitan area, including Long Island, Connecticut and New Jersey. Steve Paulus, regional vice president of NY1, said that although his channel is profitable and ad sales are “holding strong if not increasing,” the advertising market for 24-hour local news isn’t notably better than it is for any other local programming. PARIS (AP) — WPP Group PLC on Friday reported first-quarter organic revenue growth of 4.8 percent, missing analysts’ expectations of 5.4 percent.Still, the British advertising holding company’s revenue was strong in the period, boosted by strength in emerging markets and by new business wins. On a reported basis, WPP, which owns agencies including JWT, Young & Rubicam and Group M, said revenue rose 14 percent to 1.56 billion pounds ($3.08 billion) in the three months to March 31, compared with 1.37 billion pounds a year earlier. The latest figure beat analysts’ forecasts. The world’s second-largest advertising and marketing services group by sales, also confirmed its full-year margin target of 15.5 percent. WPP said Asia Pacific, Latin America, Africa and the Middle East remain its fastest-growing regions, with constant currency growth of over 15 percent. WPP released strong first quarter revenue numbers but organic revenue growth, a closely-watched industry metric which strips out the impact of acquisitions, disposals and currency movements, was slightly disappointing, Lehman said. 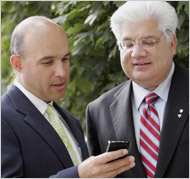 Jim Balsillieleft, and Mike Lazaridis are co-chief executives of Research In Motion, the maker of the BlackBerry. The company had focused on e-mail-craving executives, but with Apple’s iPhone breathing down its neck, it is trying to lure more consumers with phones like the Pearl, left, and the Curve. R.I.M. is the North American leader in building smartphones, those versatile handsets that operate more like computers than phones. But R.I.M. may have trouble dominating the market’s next phase. Once the exclusive domain of e-mail-obsessed professionals, smartphones are now prized by consumers who want easy access to the Web, digital music and video even more than an omnipresent connection to their in-boxes. That means R.I.M., which has historically viewed big corporations and wireless carriers as its bedrock customers, needs to alter its DNA in a hurry. While business is booming in Waterloo, analysts are raising an important question about R.I.M.’s future: Can a company that defined mobile e-mail for a generation of thumb-jockeys with bad posture also dominate the new consumer market for smartphones? In the short term, Apple’s noisy entrance into the smartphone market has elevated the visibility of smartphones and enhanced the prospects of most of its rivals. Worldwide, smartphone shipments jumped 60 percent in the last three months of 2007 over the same period the previous year, according to IDC, the tracking firm. Of the two billion cellphones sold last year, nearly 125 million were smartphones — a share that analysts expect to inexorably grow. R.I.M. added 6.5 million subscribers in its last fiscal year, twice the previous year’s amount, and its stock hit the stratosphere, more than doubling in value as investors anticipated the coming Age of the Smartphone. And R.I.M. has already introduced catchy mainstream gadgetry. The BlackBerry Pearl and Curve, two phones aimed explicitly at the consumer market, have sold well, particularly during the holiday season, and now account for a majority of R.I.M.’s device sales. But there are also signs that R.I.M. faces steeper challenges. At the end of last year, BlackBerry had a 40 percent share of the United States smartphone market, down from 45 percent at the end of 2006, thanks largely to the 17.4 percent share the iPhone grabbed in its first six months. In March, Mr. Jobs announced that Apple would take the rare step of licensing Microsoft’s corporate e-mail technology, to allow iPhones to connect directly to business computers — a dagger aimed at the heart of R.I.M.’s strength in the corporate market. In Apple’s quarterly conference call last week, Apple executives said that one-third of Fortune 500 companies were interested in giving iPhones to their employees. Apple, meanwhile, in an effort to further increase its appeal to consumers, is also expected to introduce a new 3G version of the iPhone in June, which will work on speedier wireless networks and may further attract a new segment of customers to the iPhone in the United States and abroad. In describing the threat that Apple poses to R.I.M., Charlie Wolf, an analyst at Needham & Company, describes his wife’s entirely common use of the iPhone, which she takes to bed with her each night to browse the Web. Up in Waterloo, where the towering winter snowpacks finally melted this month, R.I.M. executives appear nonplused. Though they would not reveal details, R.I.M. itself is expected to unveil a new 3G phone sometime in May and deliver it to wireless carriers throughout the year. R.I.M. employees and outside developers who are writing programs for the new phone, which has the internal code name “Meteor,” say that it will have faster processors, a larger screen and a better browser that more closely resembles the Web experience on a computer. Photographs of the device, leaked to gadget news sites, also indicate that the new BlackBerry will have elegant curves suggestive of the iPhone. It will also have a physical keyboard like previous R.I.M. devices, as opposed to the glass touch screen found on the iPhone. 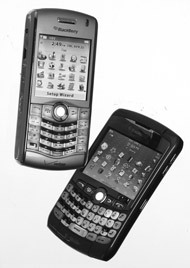 Mr. Lazaridis thinks that e-mail-dependent BlackBerry owners demand the reliability and tactile feedback of a keyboard. But, despite his critique of the iPhone, he does not dismiss the possibility that R.I.M. may itself one day sell a touch-screen phone, aimed specifically at consumers without the e-mail demands of BlackBerry’s core users. R.I.M. would not comment on future devices or media reports last week that at least one carrier, AT&T, was delaying its introduction of the newest R.I.M. phone because of problems with call quality. Those reports sent R.I.M.’s stock down nearly 3 percent in trading on Friday. Keypads and touch screens aside, R.I.M. is facing a lot of competitors in addition to Apple in the booming smartphone market. For years, Microsoft has tried to have manufacturers use its operating system for smartphones, Windows Mobile, which analysts generally think is overly complex and too difficult for consumers. The companies that license it, including Motorola, Palm and HTC, a Taiwanese manufacturer, have carved out only small fractions of the overall smartphone market. Then there is Google. Later this year, phone manufacturers have promised to start selling smartphones running Android, Google software based on the open-source operating system Linux and backed by a coalition of 34 wireless-industry companies. Google’s idea is that Android can be a more open and a less expensive alternative to the proprietary mobile technologies of Apple, Microsoft, R.I.M. and Nokia in Europe. Executives in Waterloo acknowledge these assaults but argue that R.I.M. is the only company that isn’t trying to leverage strengths in ancillary markets, and can therefore focus exclusively on mobile-phone innovation. They also seem to relish the prospect of savvy high-technology companies jockeying for position on their home turf. Mr. Balsillie thinks that R.I.M. is in the best tactical position for the coming fight. He points to its close relationships with 350 carriers around the world — like Verizon and AT&T — that sell, often at steep discounts, BlackBerry phones and the accompanying monthly e-mail service. Apple and Google, on the other hand, are vocally trying to dislodge the carriers from the nexus of the North American wireless market. Unlike other phone makers in the United States, Apple sells iPhones from its own stores and has negotiated relatively stingy contracts with the carriers, in exchange for limited periods of exclusivity. Google, for its part, unsuccessfully bid for wireless spectrum this year in an effort to force carriers to be more open to allowing various handsets and Internet services on their networks. R.I.M. is also betting on security, which hinges on the fact that its handsets and e-mail systems are relatively impervious to hackers. Mr. Lazaridis predicts that corporations will not give iPhones to their workers because they have already proved vulnerable to hackers eager to pry iPhones off AT&T’s system and make them work on other wireless networks. “It’s not that simple for an I.T. manager to give up security,” he said. INDEED, R.I.M.’s allure to carriers and corporations may be irresistible and impossible for Apple to weaken, even if Apple improves iPhone security. But some analysts still wonder what will happen to the BlackBerry’s dominance when everyday consumers start driving growth in the smartphone market. R.I.M. has always moved deliberately in embracing new handset technologies, in order to reassure corporations anxious about possible security breaches. For example, it added digital cameras and slots for removable memory cards to its phones only at the end of 2006, years after they became popular in other devices. Companies feared that these features would leave confidential corporate data vulnerable, but consumers demanded them and R.I.M. ended up providing them. Consumers also want to choose from a growing pool of entertaining software programs to buy and load onto their devices. On this front, R.I.M. may be falling behind. Apple released a set of programming tools for outside developers in March, and recently said that 200,000 programmers had downloaded the tools. The BlackBerry has been open to developers since R.I.M. started using the Java programming language in 2001. But for now, those programs are simpler and more primitive than what’s coming on the iPhone. For example, some of the new software available for the iPhone will take advantage of its support for 3-D graphics and innovative features like its motion sensor, which allows users to rotate their screens. The BlackBerry does not support 3-D graphics; it also doesn’t have a motion sensor. If motion-sensitive gaming — like that found on Nintendo’s popular Wii console — finds a home on smartphones, R.I.M. may be at a disadvantage. Analysts say that R.I.M.’s greatest challenge in a consumer-driven smartphone industry may simply be creating devices that people admire and covet as much as the iPhone. Despite the faithfulness of its flock, R.I.M. is not there yet. In a survey this year of 3,600 professionals by ChangeWave, a research company, 54 percent of BlackBerry users said they were very satisfied with their devices. Even so, the BlackBerry was a distant second in the survey: the comparable figure for the iPhone was 79 percent. SUNNYVALE, Calif. — Yahoo is beginning to pull the wraps off an online advertising system that the company said would help it and its partners drive sales of graphical and other premium ads. Yahoo executives Hilary Schneider and Michael Walrath. Yahoo said the system, called AMP and still months away from being ready, would greatly simplify the task of selling online ads, allowing Yahoo’s publishing partners, for instance, to place ads on their own sites as well as on Yahoo and on the sites of other publishers in the company’s growing network. Advertisers will be able to focus those ads by demographic profile, geography and online behavior, the company said. Yahoo is developing the system as other Internet giants, including Google, Microsoft and AOL, are all stepping up their efforts to become sellers and brokers of all types of ads on sites across the Web. Many analysts expect Google, which recently completed its acquisition of the ad-serving specialist DoubleClick, to begin making inroads into the market for graphical ads online, which Yahoo dominates. “This gives Yahoo a little leadership in vision,” said Rachel Happe, an analyst with IDC, a consulting firm. But Ms. Happe noted that Yahoo’s last big advertising project, a platform known as Panama and intended to reach people searching the Internet, was plagued by lengthy delays. She said it would be “problematic” for Yahoo if it were not able to deliver AMP on time. Yahoo executives first discussed the new system publicly in February at an Interactive Advertising Bureau meeting, calling it the Advertiser and Publisher Exchange. Yahoo executives, trying to convince shareholders that a bid by Microsoft to acquire the company underestimated Yahoo’s worth, said the new system would help Yahoo outpace the growth of the online graphical advertising market over the next three years. Yahoo has begun showing the system to publishers in its newspaper consortium, which includes hundreds of daily and weekly newspapers. Those newspapers are slated to become the first users of AMP, which Yahoo expects to begin rolling out in the late summer or in the fall. The New York Times Company’s Regional Media Group, which includes 15 newspapers, is a member of the consortium. “Yahoo clearly has put a full-court press on developing this platform,” said George B. Irish, president of Hearst Newspapers, which owns 12 dailies that are part of the Yahoo consortium. With AMP, a newspaper ad sales representative working with an advertiser, like a car dealer, would be able to easily see the ad space available on not only the newspaper’s site but also Yahoo and other Web publishers’ sites. The sales person could slice that inventory by demographic profile to, for instance, aim ads for a new hybrid S.U.V. to females of a specific income and age group. The system will help streamline a manual and time-consuming effort, Ms. Schneider said. The system, which was built out of a combination of technologies developed at Yahoo and others Yahoo obtained when it bought Right Media, BlueLithium and other companies, will also serve ads directly to publishers’ sites and allow marketers to monitor their performance. AMP’s targeting capabilities could, in theory, help Yahoo and others sell ads at higher prices, said Barry Parr, an analyst with Jupiter Research. But Mr. Parr noted that Yahoo has had difficulty focusing ads effectively on its own site and that AMP’s effectiveness remained to be proved. Scripps (SSP) is one of my favorite media companies. The E. W. Scripps Company, through its subsidiaries, operates as a media company that provides content and advertising services via the Internet. It operates through four segments: Scripps Networks, Newspapers, Broadcast Television, and Interactive Media. The Scripps Networks segment operates national television networks, including HGTV, Food Network, DIY Network, Fine Living, and Great American Country. The segment also provides video-on-demand and broadband services. The Newspapers segment operates daily and community newspapers in the United States. It also owns and operates Scripps Media Center, as well as operates Internet sites, offering users information, comprehensive news, advertising, e-commerce, and other services. The Broadcast Television segment operates ABC-affiliated stations. The Interactive Media segment offers online comparison shopping services. It operates a comparison shopping service that helps consumers find products offered for sale on the Web by online retailers, as well as operates an online comparison service that helps consumers compare prices and purchase various essential home services. The company also offers BizRate, which is a consumer feedback network that collects consumer reviews of stores and products. The E. W. Scripps Company also offers other services, including syndication and licensing of news features and comics. The company was founded in 1878 and is based in Cincinnati, Ohio. Like most media companies, Scripps is facing a threat of cannibalization. Consumers and advertisers are flocking to the Web, but the core business of Scripps – along with all traditional media firms – remains offline. It’s a harrowing experience. One that keeps executives awake at night and creates anxiety and envy. Occasionally, they’ll make $500M decisions that puts them in a corner. Interestingly, Scripps is in the process of spinning off its slower growing and mature businesses from its higher growth web business. But when you dive into their 10-K, you see a lot of interesting tidbits that shed light on how confused some traditional media companies can become in these digital days. Scripps is worth $6.8B in market capitalization. For 2007, the company’s total revenues were $2.5B with net income of almost $400M. This translates to a P/E of 18 and a P/S of 2.75. It makes sense, in some ways, to spin off the new media assets, granted… but you have to wonder about the broader repercussions and realities for old media. Our Internet sites had advertising revenues of $40 million in 2007 compared with $34.0 million in 2006 and $22.0 million in 2005. Founded in 1996, Shopzilla, formerly BizRate, is a privately held company that is expected to generate $30 million to $33 million in EBITDA profit, also excluding investment results and unusual items, on revenue of $130 million to $140 million for the full year 2005. As such, with a price tag of $525M (in cash, no less), at a $135M in revenues, this converted to a 3.9x P/S ratio. Shopzilla and uSwitch, which together make up Scripps’ Interactive Media division, generate upwards of $54M per quarter, driven largely by CPC and CPA-style referral fee revenues. For what CPC, CPA and CPM mean, along with other standard online ad terminology, click here. If you project the $200M or so that the referral business generates, at the same 3.9x P/S ratio, the unit should command a whopping $800M in a sale. Scripps is adamant that Shopzilla is not for sale, but that’s not what the rumor mill suggests. I should disclose now that Shopzilla was an advertiser of our sites in 2007. We do not have any inside information on this matter, however. But advertising is everything these days. Free, ad-supported content is what drives value these days… and much of what Scripps is doing is all about unleashing shareholder value. So let’s focus on that. Doing the math and focusing only on “Our Internet sites had advertising revenues of $40 million in 2007 compared with $34.0 million in 2006 and $22.0 million in 2005,” then that’s growth of 100% in 2 years but effective annual growth of 54% from 2005 to 2006 but only 17% from 2006 to 2007 . Multiplying that by 4, you get $52M. From 2007 to 2008, this would be growth of 30%… not bad. What happened in 2007 to kickstart growth from a paltry 17% to 30%? “In July 2007, we reached agreements to acquire the Web sites Recipezaar.com and Pickle.com for total cash consideration of approximately $30 million. Scripps can file this under “Advice You Didn’t Ask For”, particularly since I’m biased, but I am not sure Scripps is wise to be buying UGC sites, frankly. Don’t take it from me: CNET (CNET) regretted acquiring Webshots; from my vantage point, Scripps will regret buying UGC sites, too. What these sites need is not more low-quality inventory… they need to pull a AOL/Webshots and find a way to create low cost, high quality video content. strong>What does this mean for the spin-off? Regardless of what I, a mere mortal, thinks of such acquisitions, the fact remains: the company spent $30M from Scripps’ cash hoard to load up on interactive. That was wise. Scripps’ balance sheet shows $58.95M of cash but nearly $600M in debt. At even 5% interest charge (presume Scripps $2B in sales guarantee it a low interest rate or cost of debt), that is an annual $30M interest expense. In other words, in 2007, it paid $30M in annual carrying fees to spend $30M in acquisitions to kickstart its interactive growth. That makes sense, I guess: invest today for tomorrow’s growth. That’s also why, I presume, they want to spin off the new media company: more capital for more acquisitions, and to pay off debt (I am guessing about the latter, I have no idea what management’s actual use of funds and strategy is). The Web’s online ad markets are growing at 25% per annum, but with quality content you expect Scripps to outgrow the market. Moreover, while the growth rates are nothing to sneeze at… in absolute markets, they’re puny when the offline unit does $2.45B in annual sales. You cannot, after all, simply shift your offline content online and expect the same revenues. 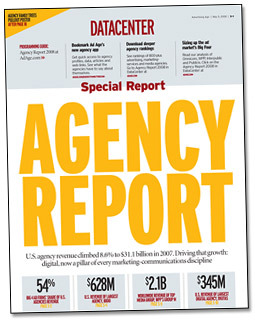 TV ads in the US were a $75B market in 2007 while web video was a $750M market. Web video and online media in general cannibalizes traditional media and TV in particular cannibalize offline revenues… Scripps is a textbook example of a victim of this phenomenon. Of course, it’s all about the share price and market cap… so maybe the financial engineering makes sense. Does it? Double the P/S and P/E for the online segments (since they are higher growth segments, this basically means that investors would bid twice as much for the growth), a $40M revenue in 2007 x 5.5 P/S ratio project a $220M company. Of course, that is just the online advertising contribution, the referral fees generate over $216M per year (if we simply take that Q3 2007 amount of $54M and multiply it by four). With the obsession over advertising these days, you have to presume that P/S for referral-based businesses is down. But since the Web does indeed command a premium to offline media, we’ll eliminate any discount or premium and simply say that today Scripps would be able to get the same multiple, 3.9x. But the problem with this rationale is that with $200+M in revenues, that would project nearly $800M in value. I don’t think anyone would pay nearly $1B for Shopzilla. In fact, given the herd mentality of investors and buyers in general, I doubt they’ll get $525M for Shopzilla because buyers would prefer to spend such an amount on sexier things: video, social networking, video games, etc. As such, if you work backwards and agree that a price is what the market will pay for something, it’s hard to imagine Shopzilla getting $500M on the market, so this means a P/S of about 2.5x. So what would all of Scripps Interactive be worth? you see that the interactive business should be an almost $1B company. If Scripps is indeed worth $6.8B… then the rationale is that you can carve out a faster growing segment, sell a portion to investors, raise money, pay down some of the debt, and then make acquisitions at a lower cost of capital. Of course, this entails that they buy the right assets and the right people. Will they? Time will tell. But considering Scripps bought – then sought to sell – Shopzilla for $525M… you have to understand why the company is going to tread carefully.